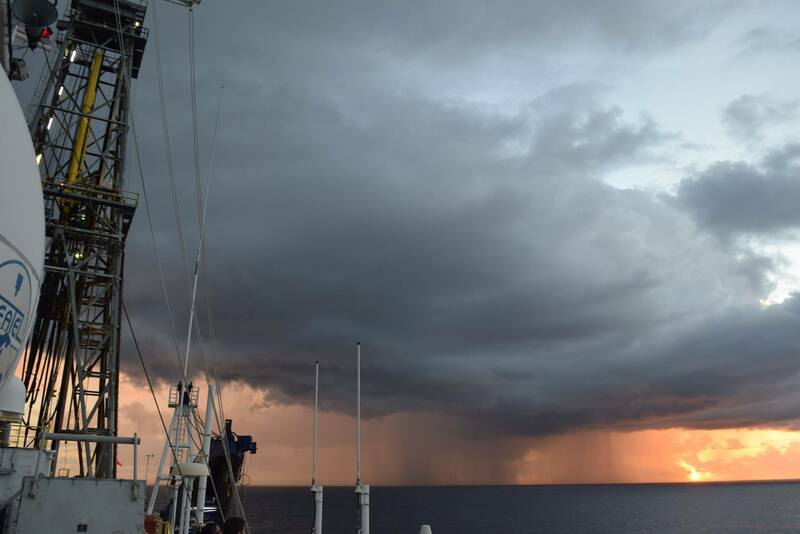 A picture of the ship with the sun rising and some incredible clouds showing off the beauty and majesty of Mother Nature. After over ten days of drilling and now down hole logging, Expedition 371 is pulling up the drill pipe and will be leaving this extraordinary drill site. The names given this site, NCTN-3A (proposed site) or the site name once drilling has begun (U1507), does not do justice to the sediments we recovered and more importantly what we have discovered. The main objectives of this site were to test several hypotheses concerning the tectonic evolution of Zealandia. This included the timing of when the New Caledonia Basin filled in with sediments as well as the timing of volcanism, which could signal the beginning of the new subduction zone east of our location. Finally we are also interested in when this basin began to subside which would be important in understanding the plate motion of Zealandia. In each case, I think that we were able to say something completely new that basically has improved and in many cases has rewritten our understanding of the tectonic history of Zealandia. Figure 1. 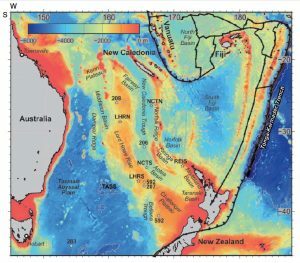 Shows the submerged continent of Zealandia, with the six drill sites. IODP Expedition 371 has just finished NCTN (New Caledonia Trough north). Figure 2. A cross section of a part of Zealandia showing the high parts (rises) and deeper sections (troughs/ basins) and approximately where our first two drill sites are located. This site was drilled in over 3,500 meters of water depth and we were able to recover sediments over 860 meters below the sea floor, with age estimates as old as over 40 million years ago. That is about 2/3’s of the way back to when dinosaurs roamed the Earth. The sediments for us geologists are like a time portal that allows us to peer back in time like Dr Who and go back to times way before humans or even hominids existed. Time traveling for geologists is what we do for a living, going back to long forgotten periods where the animals would have seemed like they were from a sci fi movie and the continents were in different positions (and looked extremely different as well!). 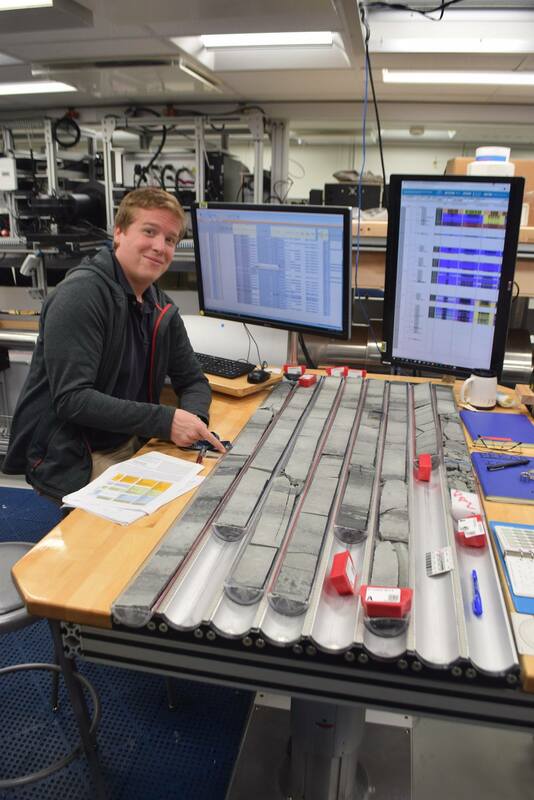 So what did we see in our sedimentary cores? Well, the upper portion of the sediments served as evidence of the relentless nature of Mother Earth, with the forces of gravity serving as a catalyst bringing down the slope of this basin huge ancient underwater avalanches that scoured and eroded the sea bottom as it rumbled down from shallower waters down into the abyss of this deep lightless tectonic depression. This deluge of sediments suspended by the chaotic flow winded its way down slope where it would begin to settle as the flood ebbed at the bottom of this abyss. The first to settle would be the largest heaviest sediments, followed by lighter and ever more minute particle. What was interesting is that where these underwater avalanches first began was already in the deep sea, so the only sediments were the microscopic shells formed by one-celled creatures. The largest of these shells are formed by an organism called foraminifers. Indeed, they often composed the lowest layer of the sediments that originated from these underwater avalanches. Foraminifers have been around since the start of when creatures first began secreting hard parts such as shells and bones over 500 million years ago. They live in the sediments or on the sea bottom as well as float in the upper portion of the ocean (upper few hundred meters). They are in the same group as amoebas. However, unlike their nebulous cousins, Foraminifers form incredibly intricate shells. It seems incredible that a one-celled creature can design such beautiful and varied shapes. Some are in the form of a shell like a snail – although it is far far smaller, being on the order of less than a quarter of a millimeter from end to end of its shell to as large as a half of a millimeter in size. For many of the other shapes, there are no megascopic analogues and pictures are the best way to explain the uniqueness of their growth patterns. Figure 3. Here are two examples of benthic (i.e., live on the sea bottom) foraminifers. To think that a creature without a brain, without a nervous system can sculpt such magnificent art forms boggles the mind. Then to think that the sea floor is littered with uncountable numbers of these microscopic shells and that below the sea floor hundreds to thousands of meters of sediments are composed of these shells literally short circuits my mind. Even smaller than the foraminiferal shells are organism called nannofossils. Unlike foraminifers that eat other things, these tiny creatures make their own food by using photosynthesis, just as plants on land do. These little plants of the ocean live in the upper couple of hundreds of meters of the ocean column. These shells are on the order of a 1/10 to a1/30 of a millimeter across; so small in fact that can best be seen in a scanning electron microscope. Figure 4. 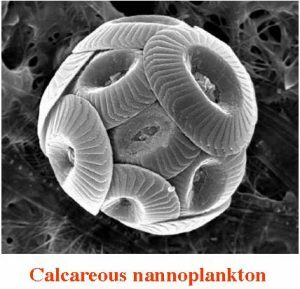 A SEM picture of a nannofossil. 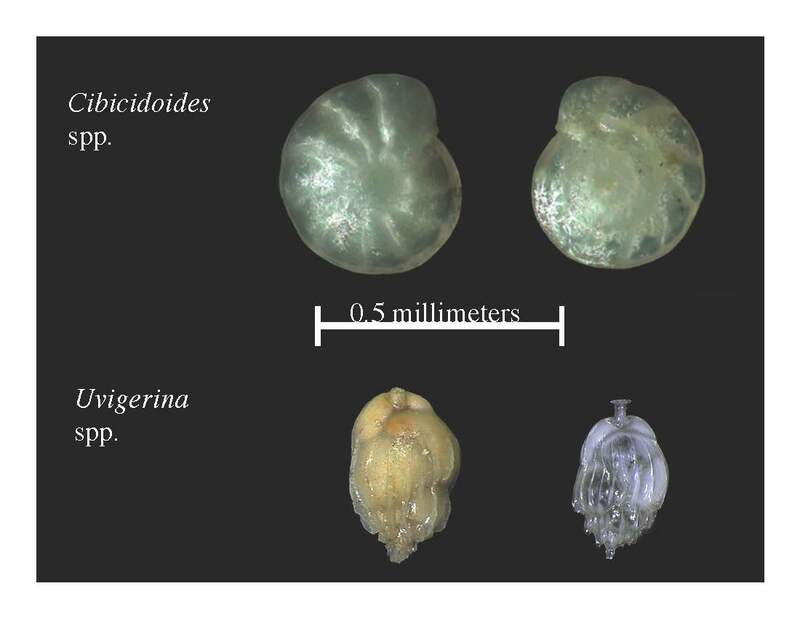 So getting back to our under sea avalanches, when the avalanche begins in the deep sea, the first to settle out of the flow are the larger foraminifers (1/2 of a millimeter) followed by progressively smaller ones and then finally the nannofossils. It was so amazing to see layers that consisted almost entirely of these tiny foraminiferal shells and to imagine the foraminiferal shells rolling down and hugging the sea bottom while a tall cloud of nannofossils towered above them. Even more bizarre and chaotic were sediments that were convoluted, twisted and bent by massive slumping of the sediment. Imagine huge blocks of sediments sliding down the tilted slope of the sea floor slithering deeper into the lower abyss. The destruction of the individual sedimentary layers resulted in an anarchy of chaotic strata, where we saw folded beds repeating over and over. One could imagine a hugs blob hugging the sea floor, slowly rolling the sedimentary layers into contorted structures that we would later see millions of year later in our sedimentary cores. It would silently make its way in utter darkness into the deep gulf that was the bottom of this basin. These features were observed by the sedimentology team within cores that spanned millions of years. Then to further complete this colophony of destruction in this anarchy of sedimentary structures is that we began to find evidence of nearby volcanoes as these under sea avalanches began to contain bits and pieces of rock that had their origins from a fiery pit from deep within the Earth. The cores acted as time machines for us allowing us to reach further and further back in time, first seeing the ancient underwater avalanches then evidence of rocks forged from a fiery origin. One could imagine somewhere near by on Zealandia laid mountains that belched fiery rocks and rolling smoke. While the actual craters may not exist any more and therefore their exact location may lie hidden to us, somewhere on Zealandia there existed perilous slopes of black jagged rocks, with gaping blemishes of fumaroles of hot steam on darkened hills, emitting hot steam and poisonous gases, sweating sulfur and water. At the top of these edifices, a lake of rolling boiling scenes of Hades itself, molten in all manner of fashion existed. The interior of these volcanic peaks are doorways to the deep Earth that would look like the Gates of Hades, which would hurl out of its rim, molten debris in all directions. This debris is what we found in many of cores spanning over thirty million years. Finally, as we traveled further back in time, to an era where before proximal volcanoes existed near our site and the deep-sea avalanches ceased to occur. A time where Zealandia was much further south than it is today (around 15 to 20 degrees further south), but because the climate was so much warmer (due to the very high atmospheric carbon dioxide levels), Zealandia was probably a tropical paradise. One could imagine large marsupial mammals roaming around on this now sunken landmass, not being aware of the fate their species would have as the land around them sank below the waves. The many scientific discoveries are still being discussed and worked out. So we will have to wait for all the data to be brought together on the ship before we can say what we have discovered about Zealandia. Below is a facebook post I entered yesterday. We have finished drilling the second site which is in a deep water basin. The sea floor is over 3,500 below sea level and we were able to penetrate over 860 meters below sea floor. We recovered an amazingly continuous sedimentary archive that revealed the tectonic history of this basin and Zealandia for the past 40 million years. As one scientist put it yesterday, “we are rewriting the geologic and tectonic history of Zealandia at this drill site.”. The science team during the night shift has also been having a great time working together, full of comradeship and team spirit as well as just good ole fun spirit and friendship. We have a ritual each morning of making sure that none of us miss the sunrise as so often we are deeply engrossed in our work. 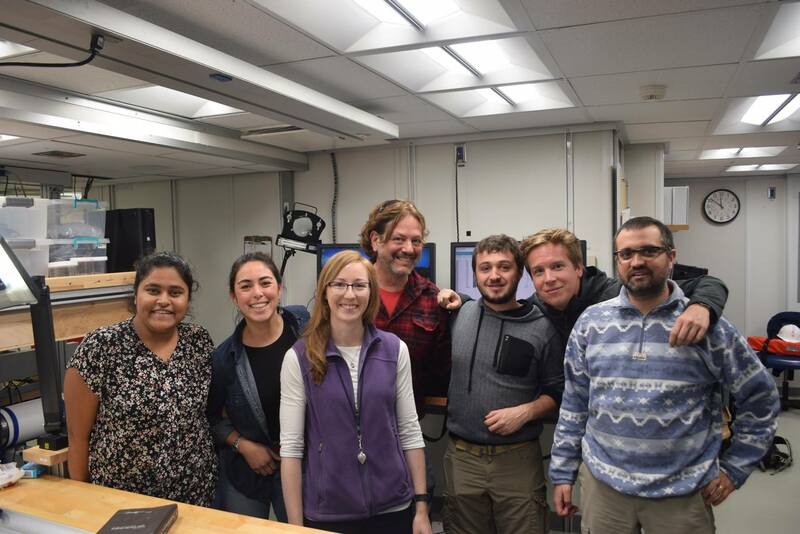 Here is a pic of most of the sedimentology team (missing Don). 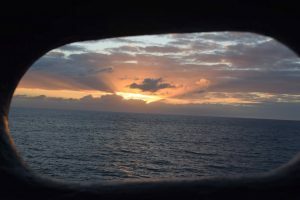 One of our many sunrises we have seen.